Triple-A Scranton lost two big league veterans today. 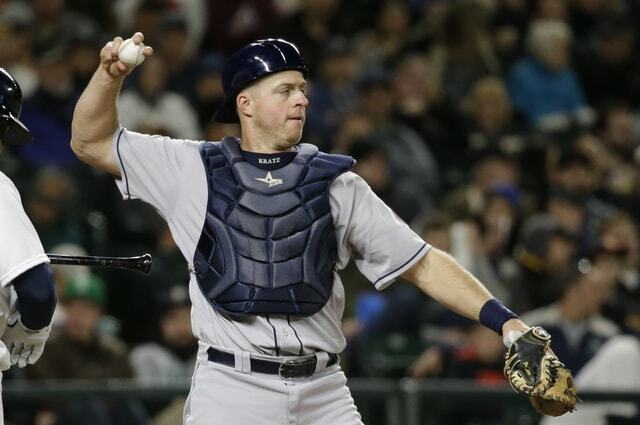 The Yankees announced they have traded catcher Erik Kratz to the Brewers for cash or a player to be named later and released first baseman Adam Lind. Catcher Wilkin Castillo was signed out of an independent league yesterday to replace Kratz. Releasing Lind is the more significant move. It tells us the Yankees are confident Greg Bird is fully recovered following ankle surgery. He is expected to join the team tomorrow, so that’s fun. Lind was essentially lefty hitting first base insurance in case Bird’s rehab was slowed or he suffered a setback. As for Kratz, I wonder if he had an opt-out in his contract coming up (June 1st? ), and indicated he was planning to use it. If so, the trade means the Yankees get something in return, and something is better than nothing. The Brewers have some catcher issues — Stephen Vogt is done for the season with shoulder surgery — hence the trade for Kratz. With Kratz gone, Kyle Higashioka is the unquestioned third catcher on the depth chart. He is already on the 40-man roster and was probably third on the depth chart even while Kratz was in the organization. 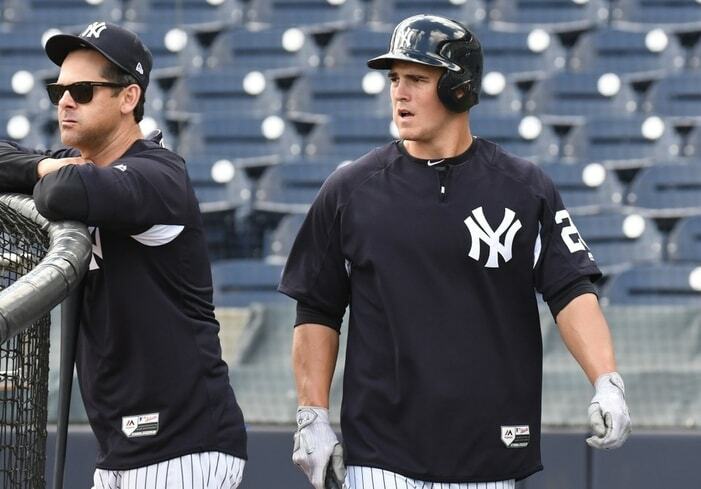 The Yankees have not yet announced a roster move to clear a spot for Bird, though Tyler Austin to Triple-A seems likely. Austin would effectively replace Lind as the team’s first baseman. The Yankees have a great deal of depth throughout their organization at this point, and that includes the 25-man roster, MLB-ready players (be it those that are no longer rookie-eligible, or those that aren’t considered top prospects), and top prospects that are expected to knock on the door in short order. The middle tier of that group has shifted considerably over the off-season, as the team made trades (Giancarlo Stanton and Brandon Drury) and signed free agents (Neil Walker, specifically), but it has come into focus as we rapidly approach Opening Day. And it is those players that I’ll dig into a bit today. A month ago, it seemed as though Austin had a spot on the Yankees roster locked-up; or, alternatively, that he had an incredibly strong inside track to a spot on the major-league roster. His ability to play first base and right-handed power made him an ideal back-up for and/or complement to Greg Bird, and the team didn’t have another player of that ilk sitting around. As long as he stayed healthy throughout the Spring (never a given with Austin), he had a good shot at making the cut. And then they traded for Brandon Drury. It was a move that would give the Yankees depth at second and third, and therefore not necessarily a move that would impede Austin’s path to the roster – but Drury is almost a year younger than Austin, offers a similar (and more proven) offensive skill-set, and has experience at all four corners, second base, and shortstop. In the event that Miguel Andujar or Gleyber Torres made the team, it was clear that Austin would end up the odd-man out. That didn’t happen, as Andujar and Torres were not long for the team, so the chance was still there. And then they signed the aforementioned Walker. And with that their starters at second and third could both fill-in at first base, and Austin’s lack of versatility within the infield spelled the end of his opportunity – for now, at least. Austin, despite never having an extended run with the Yankees, is a known commodity at this point. He has raked at Triple-A in back-to-back seasons (.323/.415/.637, 201 wRC+ in 234 PA in 2016, .275/.342/.544, 143 wRC+ in 190 PA in 2017), but that hasn’t translated all that well to the majors yet (.236/.294/.447, 94 wRC+ in 136 PA). And, despite his ability to stand in outfield, he only play out there in an emergency. If Austin ends up playing a significant role for the team this year, it will almost certainly be due to something happening to Bird, be it an injury or an extended stretch of awful performance. (Sure enough, Bird is hurt already.) And if Andujar and/or Torres end up forcing the issue, his place on the depth chart could become even more tenuous due to his lack of versatility. The last few months have not been terribly kind to Frazier. His place within the organization was thrown into question with the acquisition of Stanton, and he subsequently spent the rest of the Winter being involved in whatever trade rumors were floated for the litany of starting pitchers that are/were/could have been on the market. And then he cut off his luscious locks to curb any potential issues with the team’s grooming policy, which is a throwback to the stupidity of last off-season’s news cycle – which is a non-issue, really, but I’d be remiss if I didn’t mention it. 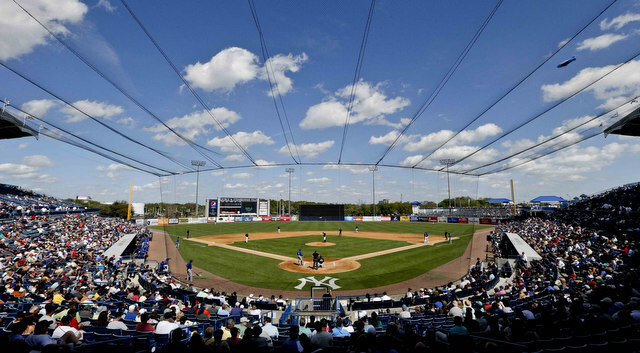 And if that wasn’t bad enough, Frazier was concussed as a result of crashing into the outfield wall in Spring Training. He hasn’t played since February 24 as a result, and he may well open the season on the disabled list. The the first few weeks his recovery were downright frightening (a concussion is a brain injury, after all), and his progress is best-described as slow and steady. With the possible exception of his injuries – an oblique injury shortly after his call-up last year and the concussion – Frazier’s stock remains largely unchanged. 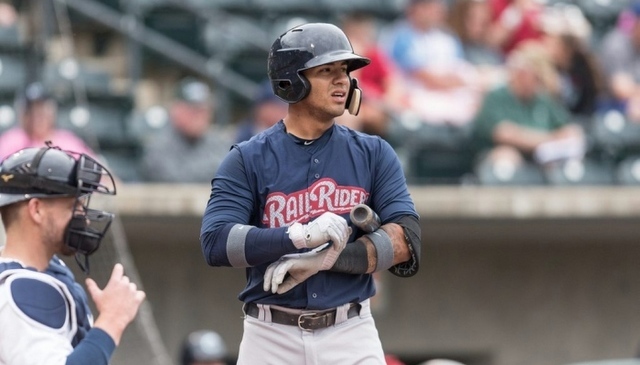 He was a consensus top-forty prospect heading into last season, he hit well at Triple-A (.256/.344/.473, 123 wRC+ – a notable improvement over his 88 wRC+ there in 2016), and flashed his potential in 39 games with the Yankees. The ridiculous bat speed, prodigious raw power, and 80-grade hustle were on display every step of the way, too. And he’ll spend most of the season as a 23-year-old, too, so there’s no reason to think that his stock is slipping. If and when he recovers from his concussion, it’ll be a matter of opportunity (or lack thereof) more than anything else. Frazier’s role with the team is going to be up in the air for some time, but I think he’s much closer to the starting lineup than one might expect. A healthy Jacoby Ellsbury would have an edge on a bench spot, but if an opportunity arose for a starting role (meaning an injury, or maybe regression from Aaron Hicks) I think Frazier would leapfrog him for the regular playing time. 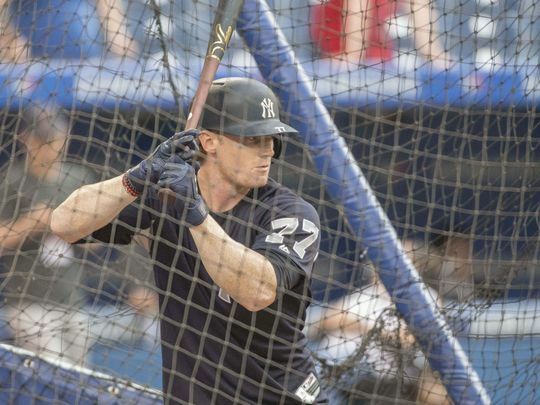 Regardless of Frazier’s future with the team, I think it would behoove the Yankees to keep him playing regularly at some level, rather than sitting on a bench. This is Higashioka’s eleventh year in the Yankees organization, and that does not quite capture how long his road to the show has been. His defense has long been considered at least solid-average, and there was always some hope that his bat would develop. He flashed a strong hit tool and a strong approach throughout his minor league career, and there were rumblings of above-average raw power, too. Unfortunately, assorted injuries and a Tommy John surgery sidelined Higashioka for most of 2012 and nearly all of 2013 and 2014, and he looked like a non-prospect when he returned in 2015. And then he went out and hit .276/.337/.511 in 416 PA between Double-A and Triple-A in 2016. And when Gary Sanchez went down with an injury in the first week of the 2017 season, some felt that he should be the Yankees starting catcher. That didn’t happen, though, and his .000/.100/.000 slash line in 20 PA as Romine’s back-up didn’t give us any reason to continue to argue otherwise. Higashioka went back down to the minors when Sanchez returned, and promptly suffered a back injury. He ended up playing in just 30 games between the minors and majors last season, and his durability is once again at the forefront of his profile. If there’s any silver lining, it might be that he hit .338/.390/.797 in the minors … but that was in all of 82 PA. The soon-to-be 28-year-old Higashioka is healthy and hitting in Spring Training, which is a good sign. I believe that he’ll be the first catcher up should the need arise, but that’s predicated upon him staying healthy – which is far from a guarantee. Do you feel the excitement in your bones? Kratz is included here largely because of the injury issues that have plagued Higashioka. He earned the call over a healthy Higashioka when the rosters expanded in September, as well, so maybe there’s even something more to it. Beyond that, Kratz is a prototypical journeyman catcher. He can’t hit (his 1.000/1.000/1.500 line in 2 PA with the Yankees notwithstanding), but he’s a good defensive catcher that grades out well in framing, blocking, and controlling the running game. Seeing him on the roster before September wouldn’t be a good sign, but he’s a competent hand. The injuries to Ellsbury and Frazier may well make McKinney an Opening Day bench piece by the time that you read this, but he fits here as this is being written. McKinney was regarded something of a throw-in in the Aroldis Chapman trade that netted Gleyber Torres, but he was always a bit more than that. He was a consensus top-100 prospect heading into 2015 and 2016, and he had a first-round pick pedigree. He struggled mightily in 2016, though, slashing just .246/.342/.338 in Double-A and, as a bat-first (or bat-only) prospect, that wasn’t a good sign. He was nevertheless worth the flier, as someone that had been lauded for above-average grades in his hit tool, power, and approach. His inclusion in the trade paid dividends in 2017, as McKinney performed decently at Double-A (.250/.339/.431, 110 wRC+ in 276 PA), and brilliantly at Triple-A (.306/.336/.541, 140 wRC+ in 224 PA), before closing out the season with a solid effort in the Arizona Fall League. There were some less than enthusing underlying numbers, such as a 4.0% walk rate in Triple-A – but a “throw-in” prospect hitting that well on the whole is a boon. And he was added to the 40-man roster in November as a result. McKinney played the outfield exclusively prior to playing first base in the Arizona Fall League, and was generally regarded as passable as a corner outfielder. He has continued to play first in Spring Training, and the reviews are generally okay. He’s still a work in progress, but he’s far from a disaster there. And, given his relative inexperience there, that’s a good sign. His strange but productive .179/.410/.607 line in Spring Training isn’t bad, either. Were it not for injuries to Ellsbury and Frazier, I’d expect McKinney to spend the vast majority of the year in Triple-A (or in another organization). There’s a real opportunity for him now, though, and I wouldn’t be shocked if he ended up on the big league roster until those two were deemed healthy; and, in Ellsbury’s case, I’m sure the Yankees will take their time with those evaluations. Whether or not that turns into a genuine opportunity is unlikely for the time being, but it’s not entirely out of the question. Peterson was signed in back in January, and there hasn’t been all that much discussion about him since. 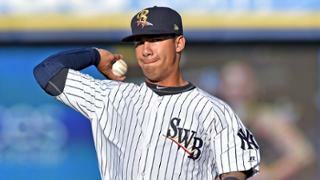 He was picked-up to be a depth piece behind or alongside Tyler Wade and Ronald Torreyes, but there was never a chance that he would be anything more than a bench player. And with the trade for Drury and the signing of Walker, the odds of Peterson playing a role with the big club this year are dependent upon several things going wrong. It’s worth noting, I suppose, that Peterson has spent time at all four infield and all three outfield spots in his big league career (even though he grades out poorly at most of them), so he could be the emergency option in plenty of ways should that opportunity arise. That’s essentially the role that Wade will play this year, though, and the versatility of Drury and Walker further abrogates the need for that sort of player anyway. He’s basically the Donovan Solano replacement, albeit with way more hurdles in his path. The Kratzken is back. 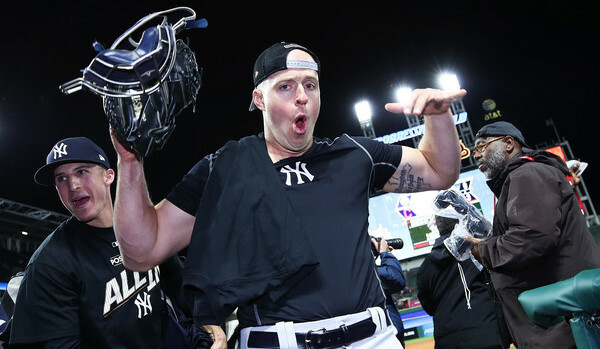 The Yankees have re-signed journeyman catcher Erik Kratz to what I assume is a minor league contract, his representatives at JMG Baseball announced. He was on the roster as the third catcher in September after coming over in a cash trade with the Indians. The Yankees outrighted him and he elected free agency after the season. Kratz, 37, went 2-for-2 with a double in September and is the all-time franchise leader with a 2.500 OPS (min. two plate appearances). True story. Kratz hit .270/.359/.472 (132 wRC+) with 13 homers in 86 Triple-A games before the trade. He is a career .203/.250/.366 (63 wRC+) hitter in the big leagues, though 24 homers in 649 plate appearances is pretty cool. 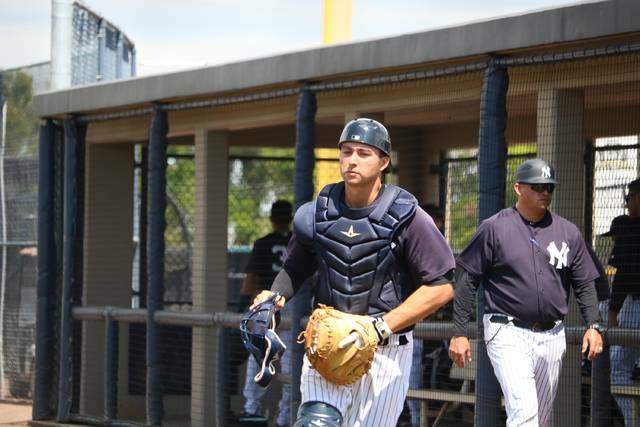 My guess is the Yankees are penciling Kratz in as Kyle Higashioka’s backup with Triple-A Scranton next year, though I suppose it is possible he will get a chance to wrestle the big league backup job away from Austin Romine. Kratz traveled with the Yankees throughout the postseason even though he wasn’t on the roster. He must’ve made a nice impression. We’ve gone through just about every player who made an appearance for the Yankees this year. The good ones. The bad ones. Now let’s get to some of the players in between, the players who are easy to forget. These are the players that you miss on the 2017 New York Yankees Sporcle quiz. First, let’s go a little more in-depth on a few players I went over in the miscellaneous first basemen review and then touch on the true bottom of the roster. 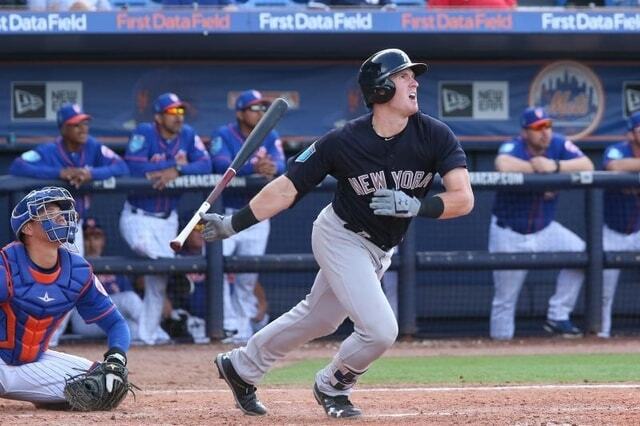 While Refsnyder had a five-game stint at first base, the Yankees didn’t use him primarily at first this year. He was called up on May 2 to replace an injured Greg Bird on the roster. Six days later, he was sent down for Chad Green. In all, Refsnyder was up-and-down three times in May, once for the single-admission Derek Jeter/Mother’s Day doubleheader and another time to take the spot of Jacoby Ellsbury post-concussion. I’ve already gone into his inability to hit this year. It was painful. But his fielding also reared its ugly head. The moment that sticks out was when he replaced Dustin Fowler after the rookie’s devastating knee injury. Refsnyder almost immediately misplayed a ball in right field during a game the Yankees lost by one run. The dream was that Refsnyder could be a Zobrist-type, but he could neither hit nor field particularly well and it’s why he’s currently on his third organization in the last year (Yankees to Blue Jays to Indians). He played six games against the Yankees with the Blue Jays in the final two months of the year and went 2-for-12. With 40 more at-bats in 2017, Austin is six at-bats shy of no longer being a rookie. And after a sub-par season due to injuries, it’s worth wondering where he fits in New York. Two separate DL stints this season really set him back from a chance to prove himself as at least a bench bat, if not the righty side of a platoon. Now, he’ll likely start 2018 in Triple A if he makes it through the offseason on the 40-man roster. Fun note: He is Pikachu in Didi’s postgame tweets. I don’t think any of these other players got an emoji. Higashioka had an impressive 2016 in the minors, earning himself the opportunity as the No. 3 catcher out of spring. His calling card in 2016 was his power, although we didn’t get a chance to see it in the majors. In his age-27 season, he walked twice and picked up no hits in 20 plate appearances while playing nine games in April. 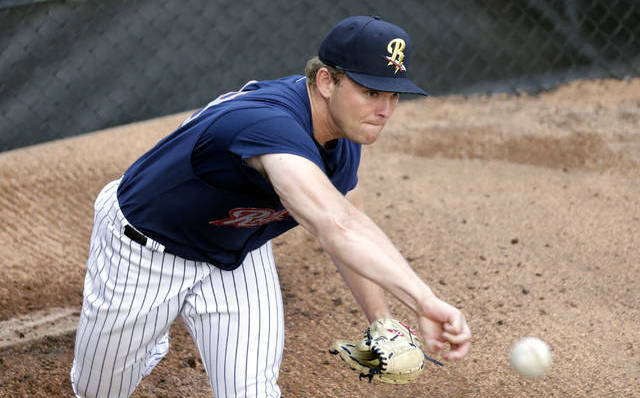 He got the chance after Gary Sanchez went down with a forearm injury, but Higgy couldn’t hack it in an extremely short sample size after debuting in the Yankees’ home opener. As he did for much of his minor league career, Higashioka dealt with injuries for much of the season. The team had to have hoped he’d turned the corner health-wise in his breakout 2016, but alas, he was unable to do so. The team had to seek out a new third catcher for September after he couldn’t make make it back from his back injury. Now he’ll have to prove himself again to make it through 2018 on the 40-man. The former top prospect spent his final games in pinstripes this season. Sad to see his time as a Yankee come to an end, but he became expendable this season with the team’s glut of young outfielders. He made five starts in June and picked up four hits, stealing two bases. No extra-base hits though, which has been part of his issues. He just couldn’t hit for much pop, nor could he work many walks. He was designated for assignment on June 29 to make room for Dustin Fowler. He spent the rest of the year in Scranton where he continued to show very little power but still produced with his legs (19 steals in 24 attempts). Williams is now with the Cincinnati Reds, having signed with the club as a minor league free agent after the season. Kozma may be the easiest 2017 Yankee to forget. He wouldn’t have made the roster at all if it wasn’t for Didi’s injury during the World Baseball Classic/Spring Training. He played just 11 games in pinstripes and made just 10 plate appearances. He had just one hit and one walk. Didn’t do anything remarkable. He was DFA’d to make room for Didi on April 28 and spent the next 3.5 months with the Rangers. He was cut from their Triple A squad in mid-August. The Yankees needed a third catcher down the stretch, so Kratz was acquired at the waiver deadline. He played in just four games and had just two at-bats. He delivered in both of them with a single and a double, finishing the season with a sterling 2.500 OPS. That’s good for a 600 wRC+. Oh snap! He hung around the team during the postseason and stood up for Aaron Judge in a postgame interview after ALDS Game 5. That’s about it for his brief Yankees career.